Violent extremism is the most extreme and serious form of online hate. It involves content (video, image, post, comment or tweet) that promotes serious bodily harm or damage to property to another person for reasons for their race, religion, gender, sexual orientation, and or political beliefs. It is imperative that such items are removed from social media as soon as possible. If you see such content on Facebook, YouTube and Twitter, report it to the platform immediately. Also report it to FightAgainstHate.com, so that we monitor the seriousness of the threat, the time taken by the platform to remove it, and escalate it to higher authorities if it isn�t removed within reasonable time. First you need to register / login. The easiest way to do this is by clicking the login with Facebook button. There is an alternative way to register but the process takes longer. You can read our guide on Registering with Fight Against Hate (without Facebook). Copy the url (link or web address) of the item you wish to report. Paste it into the New Report field then click Submit Report. Select the type of hate content the item is promoting. Select how confident you are that this classification is accurate. 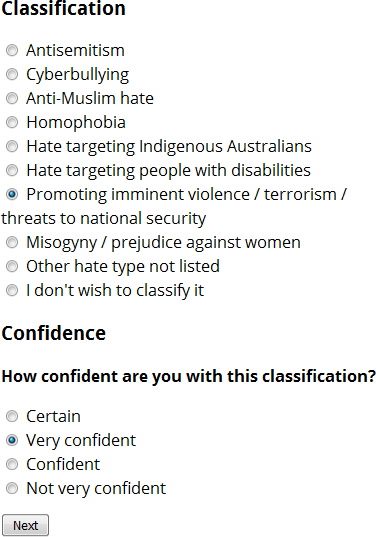 Hate classification registered, there are no more specific classification types available.